I've had asparagus on the brain thanks to all of the delicious asparagus recipes I've read recently. Last night, I decided to improvise a bit, taking inspiration from Gina, Nick, and Charmaine to create my plate of roasted asparagus and egg. I started a pot of brown rice in preparation for my egg "poaching." Once the rice was done and the rice cooker was in "keep warm" mode, I took 2 eggs each wrapped in a 1/2 paper towel, and placed them on top of the rice to cook. Charmaine recommends leaving the eggs in there for an hour, but on the advice of a friend who has experimented with this technique, I was aiming for 15-20 minutes. My plan was to take one egg out at 15 minutes and if it wasn't done, I still had a spare egg to cook. Meanwhile, I started my asparagus per Gina's instructions -- I boiled the asparagus in salted water for about 3 to 4 minutes and then drained. Next, I lined them up on a pan and drizzled with olive oil, rolling them a bit to make sure they were well covered before salting generously and sprinkling with grated Parmigiano Reggiano. (Gina also recommends topping with unsalted butter cut into tiny cubes, but I opted to skip it.) Into a preheated 400°F oven went my spears. I roasted my asparagus for about 20 minutes, until it looked pretty close to "hammered" to me. Now it was time to check on my egg. In case it wasn't done, I checked my egg by cracking it open into a bowl instead of directly onto my asparagus. As you can see from the photo above, it was very lightly poached and warm to the touch. 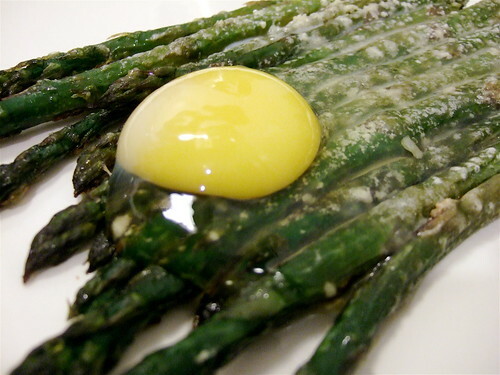 Ideally, I would have liked my egg a little more well done, but this was a fresh from the Greenmarket egg, so I felt comfortable enough eating it in this state so onto the asparagus it went! (I left the the second egg in the rice cooker for about ~40 minutes, and by that time the yolk as no longer runny, but it was still delicious.) Added some fresh ground black pepper, and it was ready for my belly. The end product? DELICIOUS.